Although I have not read Gustave Flaubert’s novel ‘Madame Bovary’, I am aware that it is considered one of the finest works of literature ever written. I might have been inclined to question that prevailing viewpoint had I not also been aware that this most recent film adaptation from director/co-writer Sophie Barthes makes some fairly significant changes to the source material. Given my unfamiliarity with the novel outside of what I could glean from Wikipedia, what specific changes, omissions, and additions the film makes are largely unknown to me, leaving me to assess the film mostly on its own merits. That said, one particular alteration I am aware of is the curious decision to open the film with (SPOILER ALERT?) 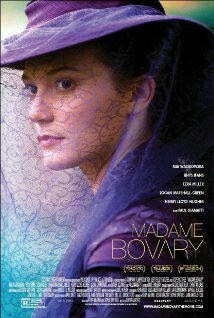 the death of its titular character, Emma Bovary (Mia Wasikowska), an event that occurs much later in the book. There are certainly occasions in which this device works, but this isn’t one of them. After Emma’s death, the film flashes back to her time learning to be a proper lady at a convent before being quickly married off to village doctor Charles Bovary (Henry Lloyd-Hughes). Given the place and time (mid nineteenth century France), this isn’t such a bad deal for Emma, but she quickly grows bored with her mate and their provincial lifestyle. The boredom leads to shopping binges (on credit) and adulterous affairs which, in turn, lead to the unhappy fate we’ve already witnessed. The tone of the film is gritty and unromantic, one aspect that does carry over from the novel (again, going from what I’ve read on Wikipedia). That point of view is an intriguing one given that period pieces like this are so often just the opposite, but as its enacted here it’s far too dull to be as interesting as it should be. It all just feels flat and dreary. It’s fine for the protagonist to be unlikeable as Madam Bovary is here, but not for her to so bland. MADAME BOVARY is competently filmed and acted, but whatever made its literary inspiration such an enduring classic would seem to have been left behind in the adaptation process. 2 out of 4 stars.